Job may have the Biblical version of patience locked up, but in mixed martial arts, Raphael Assuncao makes a strong case for being the sport’s best representative for simply going about his business until his shot at glory arrives. And such patience isn’t just restricted to the 35-year-old’s professional life. When I caught up with him nine days out from his UFC 226 bout against Rob Font, the No. 3-ranked bantamweight contender wasn’t beginning his cut down to 135 pounds or working on last minute tweaks to his game plan. No, he was fixing a flat tire on his truck. Not one of those little donut tires, but the type that fighters often toss around in training or bang with sledgehammers. Assuncao wasn’t complaining, wasn’t calling to his gym for assistance. He was changing the tire. It’s what he does and who he is. You show up, whether in life or the Octagon, and do what you need to do. On Saturday, he faces the hard-hitting Font in an attempt to extend his current winning streak to four. Is this the fight that gets him a title shot? Truer words have never been spoken. 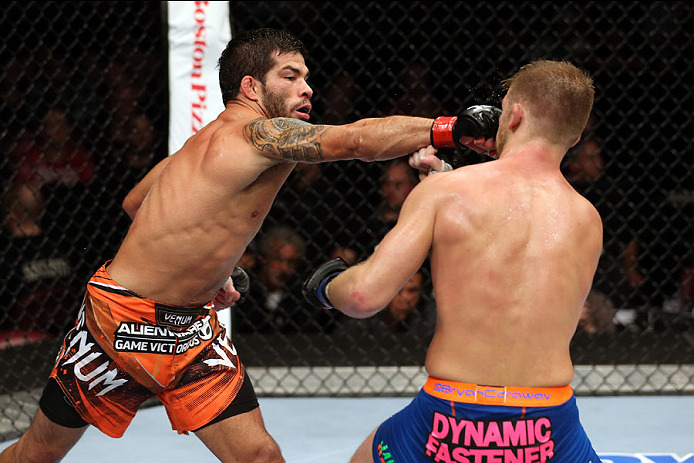 Since moving to bantamweight in 2011, Assuncao has won 10 of 11 fights, with the only loss to current champion TJ Dillashaw being in a rematch of a bout Assuncao won in 2013. Add in the names Mike Easton, Bryan Caraway, Aljamain Sterling, Moraes and Matthew Lopez, and Assuncao has as strong a case as anyone to face the winner of August’s rematch between Dillashaw and Cody Garbrandt. “I’m patient, but I’m also resilient about getting my title shot,” he said. That means he will fight, not wait. After his November knockout of Lopez, Assuncao emerged healthy and ready to get back in there, and even though it wasn’t against Dillashaw or in a title eliminator with Garbrandt, he told the UFC to line someone up. It’s reminiscent of the path of another Brazilian gentleman of the sport, Demian Maia, who put together a seven-fight winning streak before his crack at the welterweight title. Assuncao takes inspiration from his countryman. When it does, he will be ready, and he’ll know that he did it the right way. That means something to him. Assuncao’s approach has slowly but surely built his fanbase, and he appreciates that support. Eventually, he hopes to pay them back by becoming a world champion.